According to the Bureau of Meteorology, Australia had its hottest year ever in 2013 and we have now experienced heatwaves and destructive fires in the first month of 2014. Twitter went viral this week with reports that Prince Charles has said of climate change sceptic that they are like “headless chickens” (of course, we would say chooks in Australia). Well I’m right with Prince Charles when he says, “It is baffling, I must say, that in our modern world we have such blind trust in science and technology that we all accept what science tells us about everything – until, that is, it comes to climate science”. All of a sudden, and with a barrage of sheer intimidation, we are told by powerful groups of deniers that the scientists are wrong and we must abandon all our faith in so much overwhelming scientific evidence. And I am baffled as to why we have not seen and heard more on climate change during this campaign. After the overwhelming public response in September to the government de-funding the Climate Commission, and it rebuilding as the crowd funded Climate Council, I had naïvely assumed that this by-election would draw significant support and focus to action on climate change. I had expected to see key environmental groups out on the streets of my suburb backing the Greens and the ALP in their bid to stop the government abolishing legislation that will see not only the abandonment of a price on carbon, but also the end of the Clean Energy Finance Corporation and of other related legislation (11 bills in all are targeted to go). Attention and action has instead been on Medicare, which has significantly less certain outcomes than the Abbott government’s plans for legislation designed to tackle climate change. In fact, if not for the Greens and some of the minor parties climate change may soon become the forgotten issue in Australian mainstream politics. The carbon price, or ‘tax’ as the Coalition prefers to call it, has started to become for most people an abstraction or context free concept whose very purpose is forgotten. Dr Glasson has hammered it long and hard during this campaign, always referring to the $500/pa the carbon price is apparently costing voters, without any reference to the costs to the environment if action is not taken. Indeed, I was somewhat bemused to hear him on radio recently, linking the latest heatwave to rising electricity bills and thus to the “need to repeal carbon tax”. 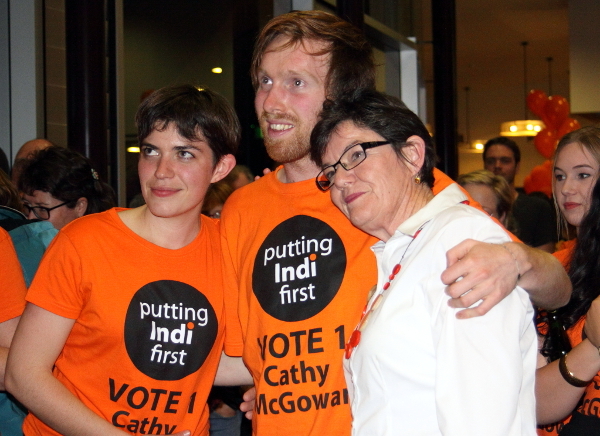 Following his campaign launch on Saturday, Dr Glasson appealed to Greens voters to preference him second. It is surprising after such a statement that there was not one follow-up question put to Dr Glasson on his ‘Green’ credentials, either on climate change or on the recent and topical Great Barrier Reef dumping issues. “I have a fair environmental rub on my shoulder,” is the phrase he used when talking to me recently. What does it mean? What are Dr Glasson’s environmental credentials and would they influence a Greens voter to preference him? Dr Glasson’s office declined to provide a response to No Fibs and I had given up the idea of talking with him some time ago. Last Saturday, however, when talking with other candidates at Davies Park markets in the Griffith suburb of West End, a friend spied Dr Glasson in the crowd and pushed me to introduce myself. I can’t give you his exact words, but this is the gist of Dr Glasson’s response. He said he is deeply concerned about the environment. He said that he understands from visits to places like India, the impacts of human-caused pollution on rivers and air quality, and said that in years past, the Brisbane River had also been extremely polluted until action was taken to clean it up. He said that while he thinks there needs to be action, the carbon price has created an impost on the people and businesses of Australia because other countries are not participating in similar schemes. He added that the Coalition’s Green Army concept is about getting young people involved in learning about and taking action to protect the environment. And on the courage of convictions, I asked Terri Butler recently why action on climate change was not mentioned at all at the Labor Party launch on January 21. Ms Butler said: “Everyone in the room at our launch and in fact the whole of the nation knows where Labor stands on climate change. The question is whether we can trust the Abbott Government when it comes to the environment”. “Labor has always believed we must act to reduce pollution. But Mr Abbott does not believe climate change is real,” she added. The Greens have been out and proud on the issue throughout the campaign. Their candidate Geoff Ebbs told No Fibs that the best way to address climate change is to have strong leadership from government. “The only way to get that is to get more Greens into power. Social movements like Get Up and 350.org have shown great leadership on this but can only influence government. Governments determine the laws and we must have change in those laws,” he said. Speaking to No Fibs, Mr Ebbs said: “We live on a river, we are less than 7 meters above the river, which is the point at which Brisbane floods, and so a 7-metre flood is the 100-year event that has made the flood plain of Brisbane fertile, but as sea water rises, we are going to get those flooding events every decade or more often”. Mr Ebbs said the reason “climate chaos” is not on the agenda for the major parties, “is that it is such a huge challenge”. We rely on cheap energy to fuel the economy as we know it, and that cheap energy has been oil. So if we keep burning fossil fuels, we’re going to cook, and we can see that in recent heat waves. “To address climate change means a serious change to the way we live, and you have to be pretty gutsy and hardy to address that, and that’s why the Greens have been pilloried in the media … because we are prepared to stand by a carbon scheme that people see as costing them money. But it’s money we are investing in the long term. We are already seeing the price of renewables come down, so what a carbon tax or any other trading mechanism does, is move us away from fossil fuels towards renewable energy. That’s the way of the future and it’s what we have to do to address climate chaos”, he said. Greens Senator for Queensland Larissa Waters, who has been campaigning with Mr Ebbs, reminded No Fibs that in the 2007 election, climate change was one of the key issues. “With the action that was taken on the carbon price [in 2010], people breathed a sigh of relief. Now that is under threat, I think it will come to the fore again. Just look at the sweltering heat wave we have had … and the terrible bushfires around the country, and in previous years the terrible extreme weather events, such as the floods … Griffith itself was underwater in the January 2011 flood”. “I think people understand that we can’t keep burning and exporting fossil fuels the way that we are … and not have effects on the way that we live and on the way our grandchildren will live. It’s really the extreme weather events that are reminding people that climate change still needs to be tackled, and if we are undoing the very laws that were starting to tackle it, we will only make things worse,” she said. Labor is not wedded to the carbon price in the way the Coalition represents it, and according to the ALP’s Ms Butler, it wants to see the introduction of a full emissions trading scheme (ETS) to replace the current carbon price. “I support using a market-based mechanism as one of the means by which we work to reduce pollution. That’s why I support terminating the carbon tax if it is replaced with an emissions trading scheme,” Ms Butler said. Ms Butler also commented: “The Abbott Government quietly released the Emissions Reduction Fund Green Paper just days before Christmas in a desperate attempt to avoid scrutiny. The lack of transparency is, unfortunately, unsurprising. It’s the same lack of transparency we’ve seen from the LNP on financial advice laws, border protection, and of course the so-called Commission of Audit, which has conveniently pushed back its reporting date until after the Griffith by-election,” she said. As to the government’s Direct Action policy, Ms Butler said it “will do nothing to change behaviour and reduce pollution. There is not one credible economist or expert who thinks his plan is a good idea. Before the election, Tony Abbott claimed his Direct Action policy would reduce Australia’s emissions. The green paper shows that it will allow the exact opposite to happen”. Ms Butler also said that she is strongly against weakening our renewable energy target. “After promising voters before the election that he would keep Australia’s renewable energy target in place, Mr Abbott now looks set to break yet another election promise”. “This is a fight between the small minority inside the Coalition who accept climate change is real and those who, like their Prime Minister, think climate change is ‘absolute crap’,” she said. “Australia’s renewable energy target has been a clear policy success driving a big expansion of wind and solar power as well as thousands of new clean energy jobs. “Jobs in the sector have tripled, wind power has tripled, households with rooftop solar increased from under 8000 to more than 1 million, and renewable energy increased its share of the National Electricity Market by 25 per cent in 2012-13. “Any moves to dump or wind back the renewable energy target would be a broken promise that destroys jobs and hurts our environment,” Ms Butler said. If the environment groups haven’t yet coalesced around action on climate change during this by-election, then maybe they will add their support to the Great Barrier Reef in this last week. The save the reef campaign has heated up in the past few days, particularly on social media, following the announcement on Friday by the Great Barrier Reef Marine Park Authority that it had granted a permit to dump dredge waste in the Great Barrier Reef Marine Park. If the Great Barrier Reef doesn’t become the major issue of #griffithvotes, there’s something wrong. However, while the protest showing outside Dr Glasson’s launch on Saturday was vocal, it lacked numbers and seemed to lack focus. “I do think climate change is a key issue for the people of Griffith. They have seen the extreme weather events, they are worried about the future of the reef, and they’re worried about the future for their grandkids,” She said. 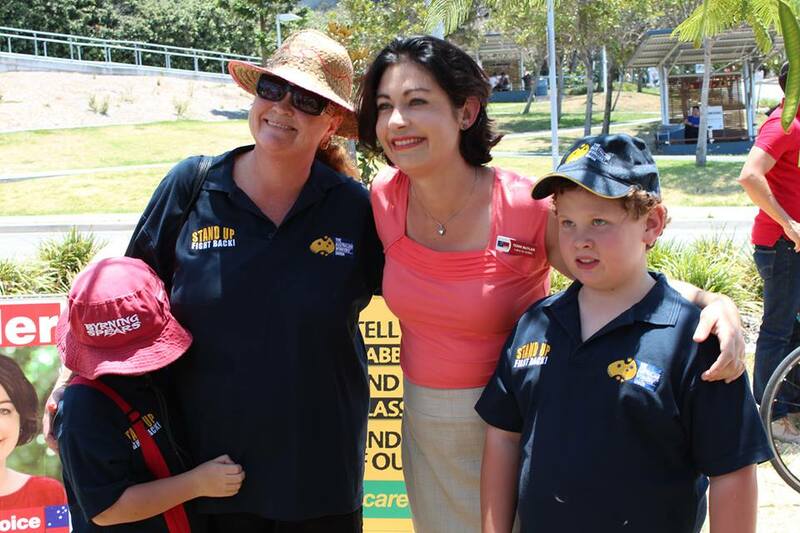 Labor’s Terri Butler told No Fibs that, “like many Australians, I’m deeply concerned by last week’s decision by the Great Barrier Reef Marine Park Authority to grant a permit to dump dredge spoil in the Great Barrier Reef Marine Park”. “The Great Barrier Reef is an Australian wonder, and sadly it is in poor health. It is critical that we do all we can to protect it, and a project like this could put the reef’s health at further risk, as well as potentially impacting on local tourism. “The Barrier Reef Authority has always enjoyed bipartisan support to make decisions in the best interest of the Great Barrier Reef. Many people are concerned about last week’s decision, and I hope the Authority has approved this application based on the best scientific advice,” she said. Where do the other parties stand on Climate Change? “We had the flood in Brisbane, so people who live in the Griffith electorate have seen the results of climate change. We know beyond doubt that we are seeing extreme weather events. That’s one thing that local people can understand,” she said. Timothy Lawrence of the Sustainable Population Party told No Fibs that population is the key. He said that individual impacts on the environment are multiplied as the population increases. “The Population Party recognises that, as a global community, we need a whole raft of responses to the climate issue. “Importantly, global population growth from 2 billion to 7 billion in just one lifetime was a huge driver of increasing greenhouse gas emissions, due to exploding energy requirements. “Furthermore, acting to stabilise global population at the United Nations’ low peak variant of around 8 billion by 2050 (potentially then dropping back to 7 billion by 2100) will greatly help to minimise future greenhouse gas emissions. 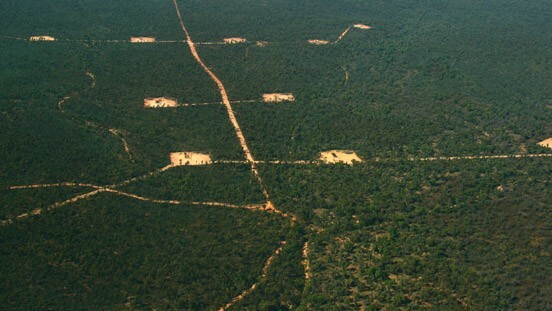 Australia managing its finite and non-renewable resources more cautiously and sustainably. Australia progressing rapidly towards using a predominantly renewable energy supply, and a low carbon economy. He said they are currently working through the specifics of these policies with their membership. He admitted, however, that climate change is a complex issue to address using his participative democracy platform. It requires leadership and careful consultation with voters to find acceptable solutions. He said he thinks to begin with, it is a matter of “marketing and selling” the issue to the constituency, and then engaging with them on solutions. Independent Travis Windsor was less clear on the issue. “You can’t have factories dumping stuff,” he said, “but again the problem is, one person thinks this, the other person thinks that … let’s get a solution”. Both Ray Sawyer of Katter’s Australian Party and Christopher Williams of Family First told No Fibs that they support the abolition of the carbon price, but when asked if they accept the science on climate change, neither seemed willing to commit. We already know we cannot trust the Abbott government. Why? Because he has systematically gutted any climate change organisations and strategies. We need to actually hear from Labor what they plan, how they will heal the damage wrought by the LNP – show some leadership! Why so little about climate change? My guess: because it’s not a vote changer. I’d like to see Ms Reid’s evidence that climate change is being dismissed as something to to with the gods, or that nuclear is a good idea. If demand per person on energy keeps rising a stable population will do nothing to stem rising energy demand. Travis, I don’t think you’ve been listening; there are many solutions already available and some already being implemented. If population keeps rising reducing GHG emissions per person will do nothing to stem rising energy demand. (This applies to ALL environmental impact, not just GHG emission, when discussing population). It’s like two sides of a rectangle simply swapping length. The question then becomes: Why is the Stable Population Party (who clearly accept the climate science and propose Australia “progresses rapidly towards using a predominantly renewable energy supply, and a low carbon economy”) the only party talking population with any meaningful targets? Probably because talking about this runs into complexity and doesn’t easily reduce to slogans. And because it is hard for a political party to admit that there will be losers – the default strategy being to deny that there will be any when it is clear there will be. I think most people would happily give up a wide-screen TV for more time with family and friends. But none of the parties are leading this kind of discussion so far as I can see. Our current lifestyle is not sustainable, and that which isn’t sustainable won’t be. According to the LNP when Queensland went "broke" under Labor, the drought, followed by flood had nothing to do with it. Now under the LNP flooding is to blame for the Great Barrier Reef dying. Nothing to do with dumping dredged spoil on it. My take on the perils of voting for micro-parties and others in the by-election: Griffith Big Bash By-election is Just Not Cricket Let the voter beware!